Review: iFetch Too - Launcher of Choice for Big Dogs? Home Dog Toys Review: iFetch Too – Launcher of Choice for Big Dogs? Does your furry friend love to play fetch even when you don’t have time to throw the ball? That’s a common problem among the owners of active pets. Giving your barking buddy plenty of fun and attention is very important to the animal’s health, happiness, and behavior. However, today’s demanding lifestyles don’t always support that need. Luckily, modern technological innovations have made their way into the products at our local pet stores, providing more options for us busy pet owners and our under-stimulated pets. One of the most popular items, the new iFetch Too, caught our attention so much that we had to check it out for ourselves. Click here to find current price on Amazon. What Is the iFetch Too? This revolutionary dog toy has been on the market for quite some time now, but unfortunately there are still many pet owners who know nothing about it. The iFetch Too is a dream come true for some – an automatic tennis ball launcher for catch-loving canines. Priced somewhat reasonably, it is relatively affordable for most modern pet owners. The iFetch Too is advertised as being designed specifically for small-to-medium-sized pups, but the larger dogs seem to like it just as well. It may be because the original iFetch used smaller balls that needed to be bought separately, while the new iFetch Too uses standard-sized tennis balls which makes it ideal for the big guys and gals. So far, numerous pet owners have posted videos on the iFetch website showing their pups having a blast with the ball launcher. Since its inception back in 2015, the iFetch Too has sold hundreds of thousands of units with no product recall yet. In fact, the launcher quickly took its place as the best one on the market – a major reason we recommend it to our loyal patrons. The new iFetch Too ball launcher features several automatically functioning settings that can be easily manipulated to control the ball’s speed, launch length, and trajectory. Each of the 3 included balls, which are slightly heavier and denser than a traditional tennis ball, can be easily swapped out for a store bought one if you so choose. We didn’t notice much of difference in the machine’s functionality between the two options. Conveniently, the new iFetch Too has three distinctive distance settings (10 feet, 25 feet, or 40 feet respectively) which help pet owners customize play based on their location. Operating the product requires little more than pressing a button and, unlike the original, the iFetch Too produces much less noise when it’s running (especially on the two lower settings). Furthermore, this product needs no batteries whatsoever – a huge advantage for traveling pet owners. Instead, the toy only requires a quick recharge to the internal battery/motor combo. Users simply plug it into a standard wall outlet for about an hour before playtime. We would have loved to get an instructional DVD, but apparently, the manufacturer of the iFetch Too also understood how simple their product was to use, and how a DVD would have been superfluous. Either way, the built-in battery of ours came with a little bit of a charge reserve leftover from shipping, so we tested it out immediately. 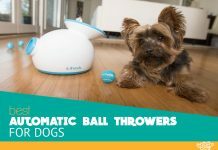 This interactive, on-demand tennis ball throwers impressed us right off the block, and from what we could tell, our dogs had the same opinion. It didn’t take long for Fido to learn how to drop the balls back into the top of the iFetch Too, so we didn’t have to be involved at all. Unfortunately, we think he likes it better that way. On the bright side, however, the iFetch Too is a larger version than the original. So, Fido easily located the ball return each time and played until he was ready for a nap. Those of us who live in small homes without much room for our pets to run might like the iFetch Too (despite its somewhat cumbersome size), but Fido will stay up howling all night if he doesn’t get one of his own. There are a lot of automatic ball launchers on the modern market, but only one is considered the best. The iFetch Too has features that are like the competition’s, but it’s known as the top dog for several good reasons. Overall, we would have to say: don’t be afraid to make the investment in your own iFetch Too automatic tennis ball launcher. Fido will certainly love you for it. Plus, it comes with a limited 6-month quality guarantee from the manufacturer, so there’s not much to lose besides a few cheap tennis balls and a bunch of pet messes made from frustration. Although the spinning mechanisms inside which propel the balls can damage or puncture the balls over time, the product pays for itself rather quickly and has an impressive shelf life. Previous articleiFetch Review – Is it Really The Best? Sure, I’d love to help.